Sussex Police said a man has died after falling from a bridge on the A27 at Hangleton. Officers said the westbound lane reopened at 10am after the incident at 6.50am this morning (November 9). Highways England said an air ambulance was called to the scene as police closed the road. A Sussex Police spokesperson said: “A man has sadly died after falling from a bridge on the A27 at Hangleton. “The incident is reported to have occurred about 6.50am on Friday, approximately one mile east of Southwick tunnel. 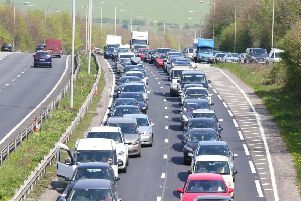 “The westbound carriageway was closed until about 10am while emergency services responded. “The man, who is yet to be identified, was sadly pronounced dead at the scene.